Find My Workspace lists over 95% of the business centres market in Manchester. Simply click Request Quote to check pricing for one office, or Add to Basket for multiple offices. A modern space in a Grade II listed building, offering both dedicated desks and private offices in the heart of the city centre. This centre offers all-inclusive pricing, 24-hour access and a rich programme of events to support you in expanding your knowledge and scaling your business. Based in the heart of Manchester, this centre offers both private office space – ranging from 4 to 12 people – and coworking options for young businesses and start-ups. The centre is a managed and serviced site, giving tenants a support network to rely on and go to with any queries. Equally, the centre places a lot of emphasis on developing the businesses within their walls, and as such there are a wealth of opportunities available for mentoring, coaching, an abundance of networking events and business expertise. The centre comes packed with useful amenities, such as ultrafast WiFi, unlimited use of meeting rooms, 24 hr access for those that don’t adhere to the typical 9-to-5, printing facilities, unlimited refreshments and, helpfully, access to their sister centres across the UK! Newly refurbished office space in the heart of Manchester that provides high-quality work space on flexible terms, for businesses of all types. 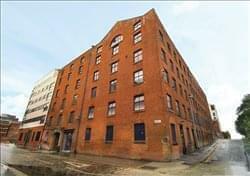 The space is available unfurnished with the option to be fully fitted out. 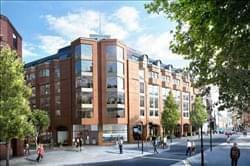 Tenants can benefit from 24-hour access and security of the building as well as the excellent on-site facilities. These amenities include showers, communal meeting spaces and a fully integrated private kitchen. There is a high-speed broadband connection throughout the property. 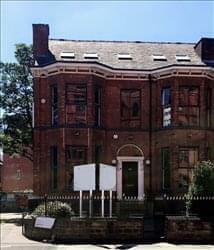 The offices are suitable for business of six to ten people with the rent of £1600 per month including service charge. Opening in November 2018, this centre promises to be bright, modern workspace that prides itself on the sense of community and collaboration within its walls, fostering a nurturing and productive culture. The all-inclusive memberships they offer come with a vast array of amenities. Tenants can take advantage of fully furnished offices, 24 hour a day 7 days a week access, free use of meeting rooms and printing facilities, lightning quick WiFi, cycle storage, shower facilities, private phone booths and a whole host of other perks. On top of all of this, the centre’s prolific events will give tenants a chance to network, relax and learn. Typical events include weekly breakfasts, beer and pizza nights, free yoga sessions, regular socials and lunch & learns. 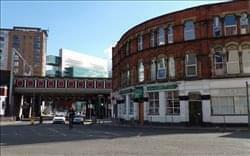 Based in the Old Trafford area of Manchester, this spacious centre offers three workspaces housed in a Victorian style house. Benefitting from an abundance of natural light conducive to a productive atmosphere, the centre also boasts private kitchen facilities for tenants to take advantage of. Potential tenants have a lot of options, with the space being able to rent as a full floor – equalling 587sqft – or on a per office basis. The centre also offers many options in terms of amenities, tenants can take the space furnished or unfurnished – allowing you lots of control over the design and layout of your workspace – and have the option of making use of the centre’s WiFi, VOIP system, administrative and IT support, reception services and printing facilities, or supplying their own. Coworking spaces are available on application. This centre is a beautiful post-industrial factory building positioned within the heart of the Old Granada Studios in St John’s, Manchester. This was the first significant post-war development in city and created by the Bernstein Brothers that still today houses purpose built TV studios. 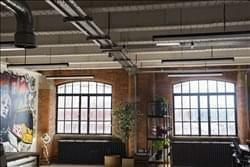 Inspiring shared furnished work space nestled in the lofts of a Grade II listed building. This space has been designed to be a home-from-home for creatives, it provides everything you may need to be productive in your work. 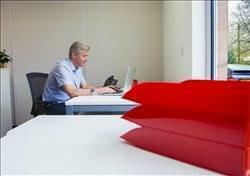 Tenants will have their own large dedicated desk where they can permanently set up and leave their things. There are also comfortable sofas, booths and hammocks to work from if you feel like getting away from your desk for the afternoon! The space is of a modern open plan feel and is impressively designed to maximise space and light. The business centre places high emphasis on the well-being of members and taking care of tenants needs so that they can focus on running their businesses. Members enjoy 24/7 access to the centre ensuring maximum flexibility in working hours. Use of all facilities (meeting rooms, internet, utilities, printing, services) is included in the flat membership rate. CCTV is in operation along with onsite management and mail handling. The centre has a diverse community of creatives from industries including fashion and print design, landscape architecture, interior design, music production, graphic design and web development. There is a wealth of knowledge and experience within the space, members often go to one another for advice, to share ideas and to pass on work. With beautiful original features, red brick walls, wooden floors and cast iron supports, this is a unique space for your business to operate from! Beautiful building which has been recently refurbished to a high standard, whilst maintaining its original features of high ceilings and featured coving. The office comes fully furnished with furniture of the highest quality including desks, chairs and boardroom table which can seat up to 6 people. A fully equipped kitchen and modern stylish bathroom complete this unique space. The office also comes with high-speed fibre broadband which is included in the price and has the added benefit of air conditioning and free parking. This space is split into 2 separate offices, comfortably accommodating 10 people. This centre is an attractive three storey self-contained office building of brick construction, complete with double glazed window units housed under a pitched roof situated in a beautiful landscaped environment. The office accommodation is arranged over ground and two upper floors. There is on-site surface car parking with the building consisting of 320 spaces at a ratio of 1:190 sq. ft. This centre is housed within a stunning three-storey Georgian-style building based at the heart of Manchester’s legal and financial district. Fully refurbished in 2015, each office suite is intelligently designed to maximise efficiency within your business. Boasting fully serviced offices, dedicated meeting rooms, a state of the art business lounge and full reception/concierge services, this centre is a perfect destination for you to grow your business or brand. 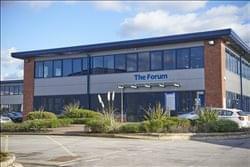 All offices within this centre are available under flexible terms, meaning no long-term tie ins for your business. And suites are available in sizes ranging from 2-50 people. All offices guarantee high quality desks, pedestals and chairs, and benefit from an abundance of natural light. This centre possesses a wide array of amenities; all offices are individually air conditioned and have 24/7 access, tenants can make use of a communal kitchen area with free tea, coffee and newspapers. 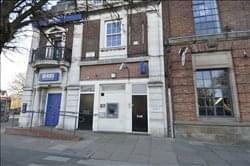 Situated in the heart of Manchester, this centre offers you the chance to have much more than just a desk. They offer a lifestyle – a lifestyle of co working and collaboration, where you share your nous with neighbouring businesses and build a network within your workspace. Their mantra is ‘individuality without isolation’, as you will establish your independent spirit and brand, but be able to learn and educate others around you in the vicinity. This brilliant opportunity is all housed within a stunning Grade II listed building, with exquisite original features. Tenants will share the building with some high profile neighbours. Within this premium professional environment, you can benefit from great flexible terms, with membership starting from five days per month to full time. Membership within this inspiring setting will include super-fast WiFi, regular events in your vibrant new home, reception services to meet and greet any guests, bike storage, and unlimited luxury coffee throughout the day. A new business centre in the heart of Manchester which is set in one of the city’s tallest office buildings, plays host to three floors of fashionably-themed serviced offices, created for organisations wanting to build a presence within this cultural epicentre. A fully refurbished and fresh environment with networking facilities and drop in zones, allows for flexible working for the commuter and permanent private space for the city goer. Situated within a stunning 28 storey building located on the outskirts of Piccadilly Gardens; this state of the art business centre not only provides organisations with a unique experience, but also offers breath-taking views across the Pennine Mountain range and the entire north-western landscape. It’s the ideal location for any growing business; from start-ups through to established corporates and encompasses different designs features across each of the floors. The flexibility of the space within this business centre offers working areas with traditional fully-furnished offices, large hot desking facilities, a variety of modern break out and co-working areas and a variety of meeting rooms available to book for internal and external clients. This array of space provides occupants with various zones to work from, along with a choice of where to take meetings to discuss more private matters. All three floors of this office space have been fully fitted out with a contemporary modern interior and boast only the highest standards in regards to the fixtures and fittings. The trendy furnishings, colour schemes and ergonomic furniture have been specifically sourced to ensure all occupants are comfortable within their surroundings; what’s been created is the perfect environment needed to have a productive work day. This new generation of serviced office is relaxed, yet smart but not super corporate; they have created a community within this business centre which provides an excellent ground for both networking and socialising. With its in-house bar, entertaining areas and event spaces this centre is truly the epitome of client hospitality within Manchester; not only that, there’s also an on-site gym, branded coffee shops and eateries with the building. The current client base ranges from entrepreneurs and SMEs right through to established companies, but is ideally suited to any growing organisation wanting to base themselves within Manchester’s Business District. 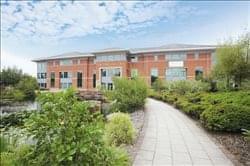 Some of the facilities offered by this business centre are; Wi-Fi with high speed broadband access, advanced IT and telephony systems with personalised call answering and IT support, private office key-card access, optional admin support, free Tea/Coffee, on-site kitchens, on-site parking (if available), bike racks, showers, etc. In addition, the centre offers ample amounts of security for both your team and clients. There is a professionally staffed reception to welcome your guests during business hours, whilst access to your offices are provided 24 hours a day; perfect for organisations trying to create a world-wide presence. The business centre’s sole purpose is to ensure the smooth running of your business; taking the day to day stresses away by offering a range of business support services; rest assured that all your business needs will be catered for, from your first viewing through to the ongoing daily needs of your team. Prestigious accommodation has been thoughtfully designed to incorporate all the features that today’s discerning occupiers consider essential – including comfort-cooling – and is available in suites from 535 sq. ft. (50m²). Offers a range of office solutions that are flexible in size to suit your individual needs. The on-site Business Park Manager ensures that day-to-day issues are planned and controlled. Benefits from generous car parking and inconspicuous but effective security. This impressive building is ideally situated with easy access to all areas of Manchester, is near to major transport links and has the added benefit of dedicated on-site parking accommodating for over 100 vehicles. Privately owned, the centre successfully combines a modern environment with stylish decor where all offices are flooded with natural light and the on-site team are dedicated to offering the highest standards of support and customer services. The spacious reception creates a lasting impression with a comfortable soft seating area, a slate water feature, and a striking vista wall offering a panoramic view of the famous Manchester skyline. Offices range in size from 1-20+ workstations and are furnished to a high standard with air conditioning, feature rich telephony, and high speed internet connectivity via a leased line supplying minimum 100Mbps to every office. Take advantage of this secure and supported environment with free and discounted conference hire with all the latest presentation technology with free Wi-Fi connectivity offering you the ideal solution for your meeting and training needs, equipped kitchens with complimentary beverages and numerous break out areas with a gourmet catering options available. Virtual services are also available offering professional call handling or a dedicated business mailing address giving businesses the chance to enjoy the credibility of a real office without the commitment of an office. Secretarial support is available from our staffed reception and discount is given on meeting room hire for all clients. To obtain information for your selected Manchester Business Centres, please tick the "Add to basket" box for each office you prefer and complete the form below. We will then send a detailed report via email.